Top 10 Countries with Fastest Internet. United States is #11. What are the Fastest Countries in the World? A recent survey by Akamai of the world’s 243 countries found the United States’s Internet speeds were 11th fastest. With U.S. consumers now having access to streaming high-definition video and movies, those speeds are nothing to slouch at. Still, consumers, Internet providers and the countries themselves are always in pursuit of faster Internet speeds that expedite the sharing of information. Internet speed is a part of national infrastructure that becomes more prominent as online activity becomes a more integral part of daily life, and there are a variety of factors that affect domestic abilities to deliver faster speeds. These speeds are increasing across all major forms of delivery, including cable, satellite internet and DSL. Here’s a quick look at the top five world leaders in Internet speed, and how they’ve managed to achieve this success. If you are curious, US came in at No. 11 with 36.6 Mbps, double the global average. Latvia may not get many mentions as a world power, but when it comes to quality of Internet connection, it’s right there with the best. Latvia currently has the fifth best Internet speeds of any country in the world, due in large part to the country’s small geographic area. This has made Latvia much easier to cover in high-speed fiber optic cabling, which, consequently, is a roadblock for many larger nations. At a peak average of 44.2 megabits per second, Latvia’s Internet speeds run about 140 percent faster than the global average. Online gaming is huge in South Korea, and a seamless experience requires fast, lag-free Internet connections. The country’s economy is also heavily dependent on technology, with electronics companies Samsung and LG calling it home. While still one of the fastest countries in the world when it comes to Internet speeds, South Korea is the only top performer to actually lose speed from the last time the survey was taken. 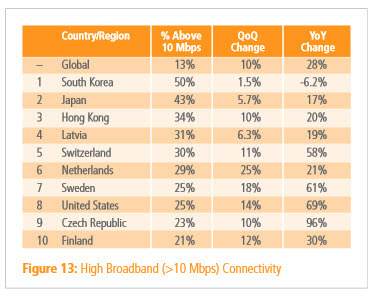 However South Korea still reigns as #1 when it comes to % of connected users who have connectivity above 10Mbps. An astounding 50% of users are above 10Mbps. 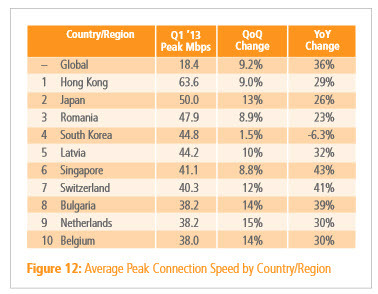 Just two years ago, Clean Cut Media posted an article showing South Korea was #1 with 15% of users above 10Mbps. Now it is 50%. Tiny, Eastern European Romania climbed up from number five to number three, thanks to a nine percent improvement in its Internet speeds. Like Latvia, Romania has a smaller area to cover and a smaller population to serve than some of the world’s larger countries. 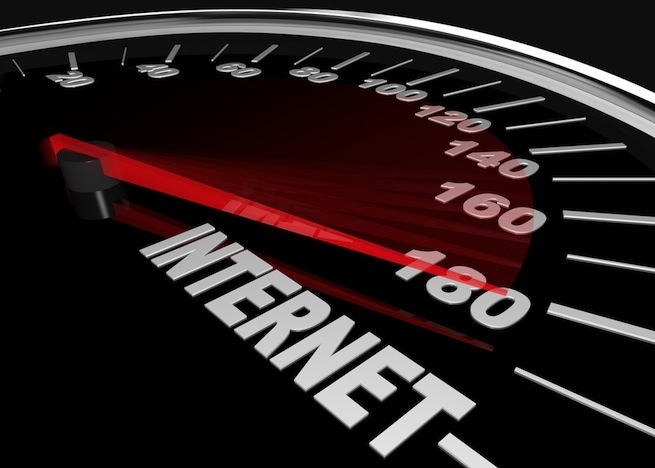 Its Internet speeds clocked in at 160 percent of the global average. Along with South Korea, Japan is one of the leaders in Internet speed not just in Asia but around the world. The country benefits from high-speed fiber optic cabling that has been installed throughout the nation. Like South Korea, Japan’s culture is saturated with technology, and its economy is built on electronics and technology manufacturing. From a country that pioneered the bullet train, it’s no surprise speed is a top priority here, where Internet connections run 170 percent faster than the global average. Hong Kong has all of the ingredients needed to be the worldwide leader in Internet speed. It is one of the most dense areas in the world, which makes infrastructure much more easy to install. It’s also a wealthy, tech-savvy Chinese region, and like other developed Asian nations, technology plays a large role in the culture here. At 63.6 Mbps, Hong Kong’s Internet speeds are more than three times the global average, and more than 20 percent faster than any other country. Do you feel small and insignificant compared to these ridiculous high speeds?